I’m home from a lovely trip to WA and back to laundry, cranky children, and a car that is in desperate need if vacuuming. Coming home from vacation is the worst part of vacation. :) I managed to get these photos edited….this quilt is my favorite yet (I always say that). The fabric is from this fat quarter stack at The Fat Quarter Shop. The pattern is called Seville (big surprise) and is available in my own shop in hard copy or PDF, and at The Fat Quarter Shop here. This pattern in is full color….all of mine from now on will be. The pattern uses 10 fat quarters plus white fabric and a border. I wouldn’t call it a hard pattern because the blocks go together very quickly and easily, but you do have to have some experience seam matching and pinning when your sewing the quilt together. I sure do love this quilt! Now back to cleaning up spilled Frosted Flakes in my carpet…. So stunning! 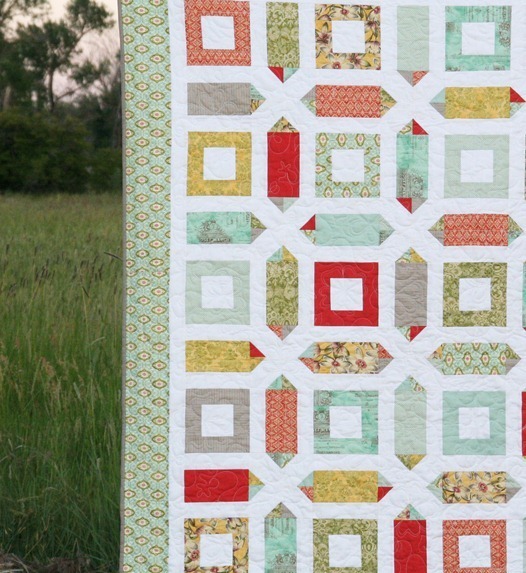 This pattern (and fat quarter stack) is definitely going on my birthday wish list! this is a really cool pattern. I love it. Love everything about this one! And love it on your bed, btw…very nice and clean with the white. wow what a lovely quilt!! I love how the white makes all the other colors pop. Very nice indeed! This is fantastic! (I probably think that about all your quilts though :) ). Just one more of your quilts for me to pin and add to my list. I lo-o-o-ove this It's so interesting without being too cluttery. And I really like the nice wide border. It's my favorite so far as well! Absolutely beautiful! I love the fabric and the pattern! I adore this pattern. It's going on my to-do list. And at the top, no less! I agree that coming back from holiday is the worst part. I hate unpacking bags and cases! That is a beautiful quilt. Hope you enjoyed your holiday, it's always back to earth with a bump when you get back home isn't it? 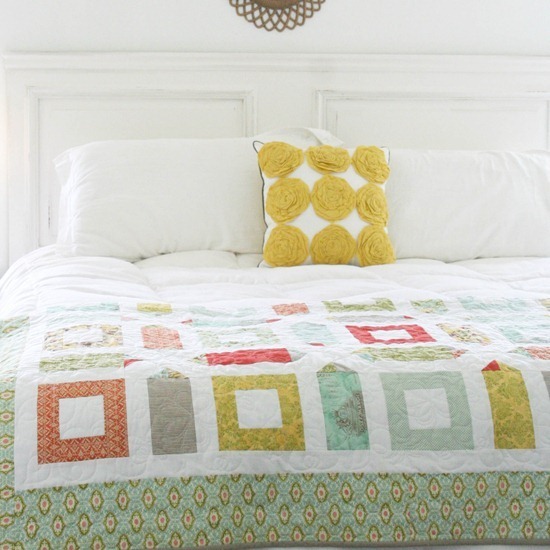 Beautiful quilt that has a quiet/energetic feel to it! I love how those two aspects of it work so well together. I love your quilt and fabric choice Allison and the bed photo is perfect, I'm going to have to pin it..lol We are working on a door headboard, can't wait!! So in love with this quilt! It is so summery and breezy (even though that it is almost fall.) I have a million color ideas I would love to try out with this pattern. I will be purchasing this pattern too! Absolutely beautiful. Really benautiful! I love it! Beautiful quilt! I really like the secondary designs. I love this quilt! Will be making it for sure! I think I just bought that border fabric this morning! I think this is beautiful, I would love to make one! This is SO lovely! I really like the pattern, so much! Love the quilt, both pattern and fabric choices. Beautiful pattern and looks lovely in these fabrics. Ooooh, la la! I'm loving the secondary pattern the white of the blocks makes!! Thanks for sharing! While you've got the vacuum out…um….we have doggie hair that needs picked up……if you're so inclined! Simply gorgeous! I love it! Just found your blog. So glad I did. Wow, your quilt is gorgeous. All of your quilts are. I hope you don't mind me asking where your from. Some pictures look familiar. 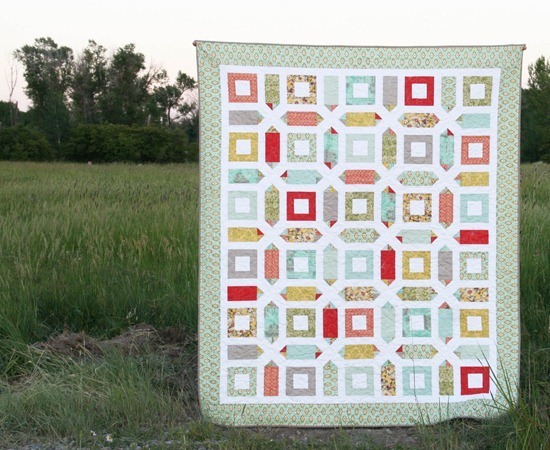 Do you have a bigger picture of the aqua, yellow, grey and green quilt in the right corner of your home page (with the cute little baby buns and toes peeking out)?? Thanks so much!! Love it! Very nice job. LOVE the colors on this one! It's beautiful. The colors, the design. I love it! I love that pillow! oh and of course the quilt but did you make that pillow–it's perfect! I LOVE this pattern… I do have a question, though. Are the pieces small enough to get from a layer cake? I have a layer cake of fabric that would look great in this pattern. I love this quilt! It interests me that it's full of color, but the border calms it and brings it all together. Nice job. Hi! I'm a new commer here, but I think I'll come back! Your quilts are amazing!!! SO CUTE! SO NICE! I like this pattern, it's very interesting! I’d love too take a class on this quilt.